"I Will Sing of Jesus’ Love"
Note: The narrator doesn’t need to memorize the story, but he or she should be familiar enough with the material so as not to have to read it. Remember, you can supplement the story with photos from the Mission Quarterlies’ Facebook page. Narrator: This quarter we have met people from Ebeye [pronounced: EE-by] Island; the Mamawi Atosketan [pronounced: MAMA-way a-TOSS-key-tan] Native School in Alberta, Canada; West Virginia; and Holbrook Seventh-day Adventist Indian School in Arizona. Today we will hear one more story from Holbrook that reminds us that the great controversy is very real—and Jesus is coming soon. The 14-year-old girl was invited into the pastor’s office to discuss why she had skipped classes. Instead of focusing on her misbehavior, the meeting turned into a vivid unfolding of the great controversy between Christ and Satan. School case manager Giselle Ortiz noticed that something wasn’t right after being summoned to the meeting between Dezba*, an eighth grader, and Phil Vecchiarelli, then-pastor of Holbrook Seventh-day Adventist Indian School in the U.S. state of Arizona. Then she interrupted the pastor. “I have a voice inside, and he is telling me that you are lying and that book is a book of lies,” she said. It was like a boxing match, with the girl screaming, and the pastor fearlessly pushing back. Giselle prayed silently, claiming Bible promises and thanking Jesus for the imminent victory. As the pastor read another promise, Dezba doubled over in pain and fell to the floor. Then she sprang to her feet and fled out the door into the hallway of the boarding school’s administration building. Giselle ran after her, worried that she might try to leave the campus. Dezba turned around and looked at Giselle. The expression on her face was indescribable. Giselle knew it wasn’t the girl looking at her, and she swallowed back the fear in her throat. Outside the building, Giselle sat down with Dezba on concrete steps. Pastor Phil soon joined them. “Are you accepting Jesus into your life?” the pastor asked. “Yes, I’m accepting Jesus into my life,” she said, her voice filled with pain. In an instant, it was over. The evil spirit left, and Dezba lay motionless. “Do you feel tired?” Pastor Phil said. Giselle was overcome with emotion and began crying. “It was beautiful to see that victory,” she said later. After a while, Dezba went to the girls’ dormitory and, with Giselle’s help, set apart her room for Jesus. The two copied Bible promises onto posters and hung them on the walls. 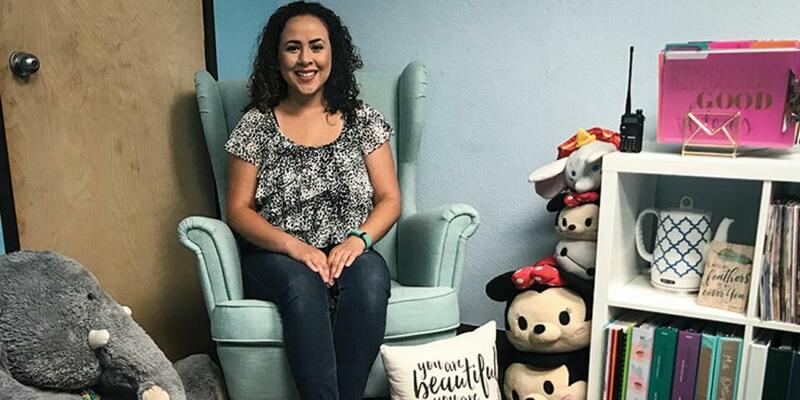 That was not the only incident in which Giselle, a 27-year-old graduate of Southwestern Adventist University, and other Holbrook employees have seen the great controversy firsthand. Once, during a meeting with a girl in Giselle’s office, the girl started playing with her lips and staring in the corner. The girl said she saw her dead stepfather there. Giselle felt a coldness fill the room, and she immediately prayed and rebuked the evil spirit. The spirit left. In the morning, the girls’ dean, who lived above Giselle, told her that the previous night she had felt a presence in her room and an invisible hand had started pressing her into the bed. She had been terrified and couldn’t move. Then, in a flash, the hand had left. The presence had left after Giselle’s prayer. Such encounters remind Giselle that the great controversy is real and that Jesus is coming soon. Giselle said she loves mission work, and she wouldn’t trade her job for any other. Narrator: Jesus is coming soon! This quarter, we have heard stories about how the Holy Spirit is being poured out on schools in Canada, the Marshall Islands, and the United States. We have heard about the power of evangelistic meetings. Today, the question is: What are you doing for mission? Like Giselle at Holbrook school, are you excited about mission and feeling more alive than ever before? Let’s do our part for mission today by giving a big Thirteenth Sabbath Offering. *The girl’s name has been changed. Dezba is a Navajo girl’s name that means “war,” signifying uncertainty and strength.